The Cisco Champions for 2016 are announced and I am proud an very honoured to be selected as a Cisco Champion for the 4th year in a row! 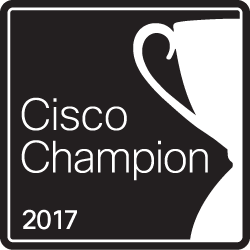 As another bonus this year, my colleague Rob Heygele is selected as Cisco Champion for the 3th year in a row! Congrats to him and offcourse to all other fellow Champions of 2017! See you soon!